Newton is a true 21st century suburb, a far cry from the supposed simplicity and conformity of the 1950s, and much more interesting because of it. To begin, Canadian suburbs have become multi-cultural, and Surrey is, for its size, one of the most popular destinations for immigrants. Nearly one quarter of the population of Surrey have South Asian origins (principally, Sikhs from Punjab), the second largest such community in any Canadian municipality. Both recent immigrants and long established residents of South Asian origin enliven its public spaces and, with restaurants and markets along its arterial streets filled with the scents of the Punjab, saris in the strip malls. Newton is as complex socially as it is ethnically, with pockets of disadvantaged citizens alternating with middle class and upper middle class enclaves. This is one of Surrey's largest component ''Towns,'' but it is one that many have trouble identifying. More bluntly, and more important for the cause of this design competition, Newton is a failed Town Centre, with no logic or pattern to the location of its public institutions, its shortage of public space, and its serious problems with drug dealing and public intoxication/drug use, problems intensified because of Newton's core urban and street structure and lack of housing. There are some good intentions and one outstanding example of contemporary architecture at Newton Town Centre, but it has never adhered as a hub for the community. Newton provides a wonderful opportunity for designers to craft a more transit-oriented urban future, and to heal a split and troubled Town Centre. In large part because of a lack of nearby housing (''eyes on the street'' in Jane Jacobs' apt phrase) the current transit exchange on 72 Avenue has long been troubled by drug dealing and use. Translink has committed to planning a new intermodal transit exchange three blocks to the southwest. 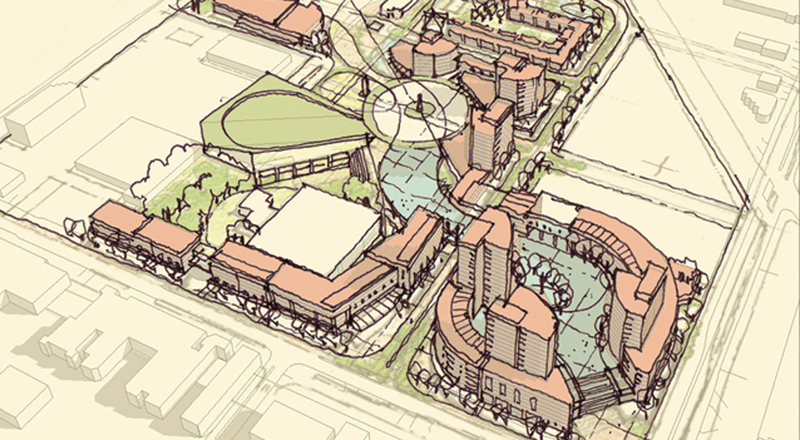 Working with the community and the City of Surrey, it is hoped that transit-oriented re-development of Newton Town Centre will transform it. This is the core assumption in your charge-a large transit hub and a large number of day and night residents will make Newton's core a safer and more urbane location, a New Town, in other words. Your task as a designer is to boldly re-shape the entire Town Centre, your skills applied to crafting massing for the many new blocks of housing, the re-ordering of civic elements like the Cenotaph and ice arena, and the re-design of public spaces and connections arrayed between all of these. Your central task as designers is to find a humane and amenable way to bring one thousand new units of housing to Newton, re-making it as a New Town. This scale of new development will help pay for the parks, public realm improvements, and a new arena and community centre, and provide a key new ridership for transit improvements-it is intended this area become a showpiece of transit-oriented development.